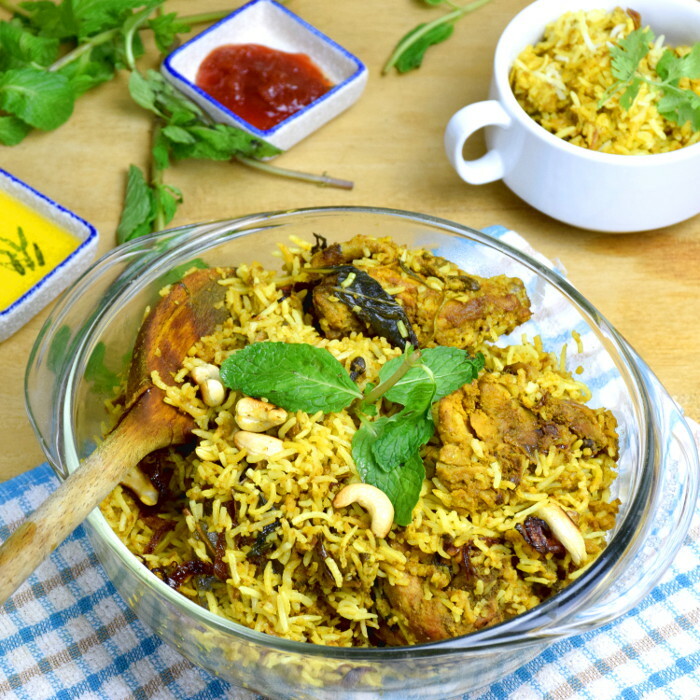 Everyone loves chicken biryani rice, and here is why this deliciously flavored chicken biryani recipe conquers the heart of the most demanding gastronomes. I have added this new section at the end of this article. You can access it straight away by scrolling to the end of this article. Chicken biryani, briyani or biriyani? Biryani is also known as biryani, briyani or biriyani. 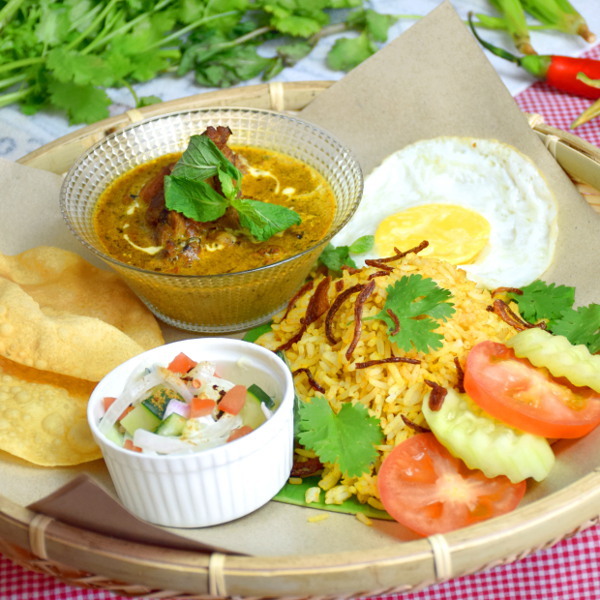 It is a South Asian rice dish with the origin from the Indian subcontinent. The ingredients vary, but always include meat (chicken, mutton or beef), a mixture of spices, mint leaves, coriander leaves, fried onions, and yogurt. These ingredients are combined with meat and marinated for at least half a day, and then cooked together with rice, fried onions, and coriander leaves. The meat and spices will eventually flavor the rice to give a fabulous aroma and taste. There are two ways to cook the chicken biryani. In kacchi biryani, the chef put the marinated meat at the bottom of the pot. 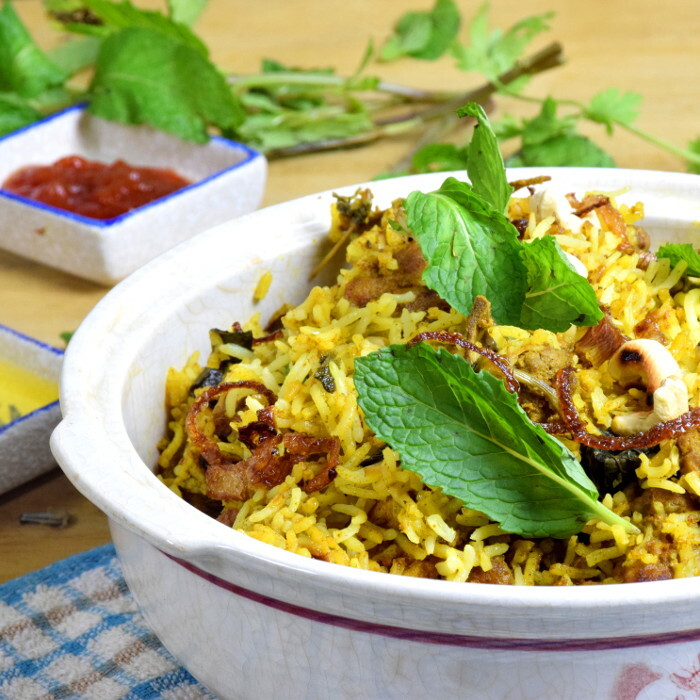 The rice is half-cooked in another pot, drained and placed over the meat alternate with layers of fried onions, coriander, and mint leaves. This method produces the best chicken biryani because the flavor of the spices and meat will be absorbed by the rice, which makes it very flavorful and aromatic. Pakki biryani is slightly different. 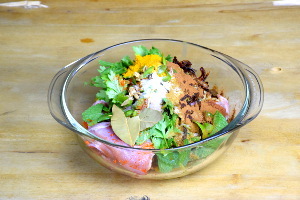 The chef will cook the marinated meat separately, and then layered with the rice, fried onions, and the leaves later. The Pakki method is easy to prepare, but the kacchi method produces the better result. Do not worry about the long list of ingredients. The seeming complicated process of preparing biryani rice can be made in a jiffy once you know the method. However, don’t compromise the list of ingredients if you want to reproduce the most authentic chicken biryani at home. What you need is a heavy skillet with a tight lid, plus the patients to cook it over a very low heat. If you are ready to do this, you are on the way to cook up one of the most aromatic rice dishes you can imagine. After cooking biryani rice for some year for my customers, I have learned and discovered the important points to take note while preparing it. Please read the note below before attempting the recipe. I hope all this tips and observation I have gone through so far will help you to produce the best biryani. You can use either chicken, mutton or beef. Cut the meat into large chunks with bone-on. The bone adds flavor to the rice while cooking, and it can make the rice to be much tastier compared to by using boneless meat. The ingredients of the marinade differ slightly from different region and countries. However, there is similarity among all the versions. They all contain yogurt, either lime or lemon juice and a range of ground spices. Marinate the meat for at least half a day, preferably overnight if time is allowable. Since the meat pieces are thicker than fillets, therefore the spices required more time to penetrate into the center. Long marinating time is necessary because a good chicken biryani should have meat that is flavorful for every bite, not just on the surface. You should use ground spices for better marinating effect. Nowadays, many grocery shops provide ready-made ground spices. 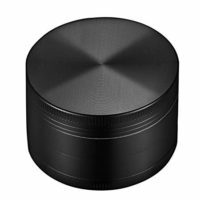 If you only manage to get the spices in a whole piece, ground it with a spice herb grinder before using it. The aroma and spices lost over time. Buy the amount that you need or the smallest amount that is available. 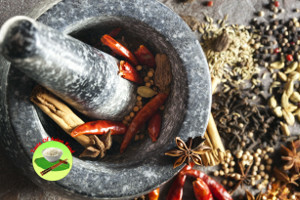 Always store the spices in the cold and dry place, away from light. Use plain yogurt (common sense). Most of us have yogurt with fruit flavor in the refrigerator, but they will affect the taste of chicken biryani. 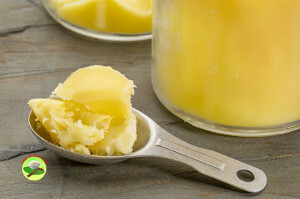 Ghee is purified butter, which is the preferred oil for biryani and other Indian dishes. 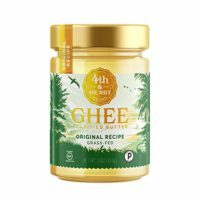 You can use unsalted butter as the substitution if you do not want to buy a large can of ghee, which you may not use it in future. 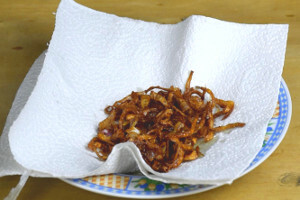 Fried onion is an essential ingredient to prepare biryani. Slice the onion paper thin, and separate them by using your hand. Deep fried the onion slice in vegetable oil over low to medium heat. Stir the onions occasionally to ensure even browning, until it turns golden brown. Drain away the excess oil. You will notice the aroma of fried onion is entirely different from raw onion, which is what we need to cook chicken biryani. Coriander and mint leaves add freshness to the rice. You can either use the whole leaves or give a few rough chops. However, please do not substitute with other leaves as to preserve the authenticity. Use either one of them if the other one is not available. 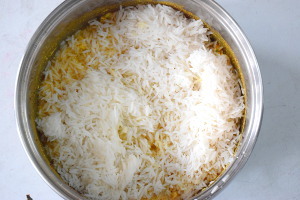 Basmati rice is the long grain rice suitable to prepare biryani. Since it is less sticky than other types of rice, every grain of rice is well defined and separated from each other. That is what it should be for a good biryani rice. Medium and long grain rice is stickier and therefore will not produce the beautiful texture as basmati rice. The reason behind the selection of basmati rice is similar to use Arborio rice for risotto, in which it is explicitly for such purpose. 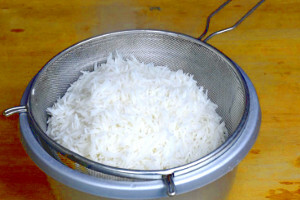 You can shorten the time to cook the rice by soaking the basmati rice in water for 45 minutes before boiling it. After that, put the soaked rice in a large pot of boiling water, with the amount of water at least three times the volume of the rice. Add some salt to the water, much like cooking pasta. You can also add some cloves, cinnamon, cardamom and bay leaf into the water to add some flavor to the rice. I find that you can omit this step since the spices from the marinade the chicken will eventually absorb by the rice during cooking. Stir the rice occasionally to avoid it from sticking to the bottom of the pot. You will notice that the rice grains slowly become larger and whiter, which indicates that the rice is cooking. You need to cook the rice until only half done, which takes about three minutes. Remove a grain of rice from the boiling water and place it on a flat surface. The rice is half-cooked if you can break it into half by pressing it with your fingers. When this happens, remove the rice from heat and drain away the water. The half cooked rice is ready to cook together with marinated chicken. You may wonder why is it necessary to half cook the rice. The rice is laid on top of the chicken in the pot and cooked over very low heat. That means the chicken will get the heat first from the stove earlier than the rice on top. Pre-cooked the rice for three minutes will solve this problem, in which the chicken and the rice will reach the desired doneness at the same time. If you have seen the traditional method of making chicken biryani, you will be amazed that the chef uses the chapati dough to seal the edge of the cover. He will seal the edge of the lid with chapati dough (or any bread dough) to prevent steam from escaping from the pot. What if you do not have any bread dough? If you do not have the chapati or bread dough, seal up the edge of the lid with a piece of kitchen towel. The whole purpose is to let the steam inside the skillet to cook the chicken, which is the best way to keep the steam in the pot. You need to use very low heat to cook the biryani. The yogurt at the bottom of the pot can burn fairly quickly over high heat. The traditional method of cooking biryani is to put the pot on a tawa (a flat, dish-shape frying pan) or a saucepan. The heat from the stove will be further away from the pot and is partially insulated by the tawa. This method is useful if the is still too high even you have adjusted it to the minimum. Let the steam to cook the rice and the meat. 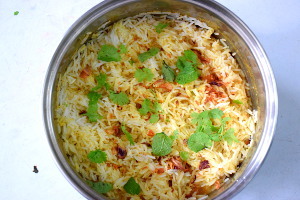 Cooking with steam in an enclosed utensil produce the best biryani rice. Cook the chicken biryani over very low heat for about 40 minutes. You will start to smell the aroma of the biryani after about 20 minutes. Do not open the lid until the end. After 40 minutes, switch off the stove and let it stands for another 10 minutes before serving. 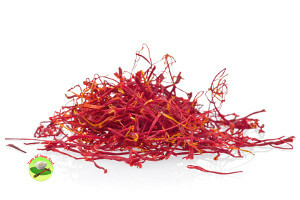 Saffron is an expensive herb, which renders fragrance to the biryani. You can do without it if you do not have saffron. You can add a few drops of coloring to the rice, but I prefer the natural color. 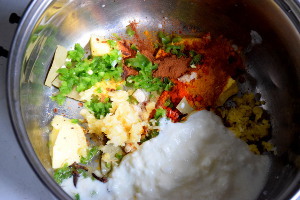 You may I want to add a few drops of red coloring if you want since the base color of biriyani rice is bright yellow. In 1/2 cup of warm milk crush a pinch of saffron strands and put some whole strands. Wait till it turns yellow. Pour onto the rice before cover the pot with the lid. A picture worth a thousand words. BUT a video tells more than a thousand pictures. Watch how to prepare chicken biryani! This recipe is the biryani rice I use in my cafe, based on Hyderabad biryani with some Malaysian influence. Cut the chicken into large chunks, bone-in, skin on. Cut the onion into thin slices. Deep fried in oil over low to medium heat until the onion is caramelized and turn golden brown. Mix half of the fried onion, coriander and mint leaves with the rest of the ingredients for marination. Keep the marinated chicken in the refrigerator overnight. Soak the basmati rice in water for 45 minutes. Drained. Bring the water to a boil. Add some salt. Cook over medium to high heat for three minutes. Keep stirring. Place the marinated chicken in a heavy bottom pot. Spread half of the rice on it. Spread half of the remaining fried onions, coriander and mint leafs on the rice. 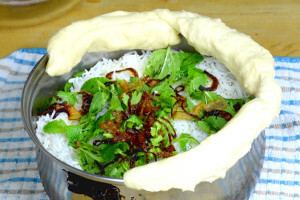 Layer the remaining rice on the fried onion, coriander, and mint leaves. Place a saucepan under the pot and cook the rice over very low heat for another 30 minutes. The following is my short-cut method to prepare the delicious biryani rice. If you are looking for an easy way out, this is THE ONE recipe you should follow. Take note that this is NOT the traditional method, but is a proven recipe endorsed by our customers. I develop this recipe because our customers want us to serve the rice with beef rendang, curry chicken as well as butter chicken. This biryani rice enables us the to match with anyone of this cuisine. What you need is chicken stock since the rice is not cooked on top the marinated chicken. We prepare our stock, but you can just get the ready-made one. Measure the following ingredients and put it into a pot. Mix all the ingredients with a spatula. Prepare the rice just like the main recipe. Since there is not chicken in the pot, you need to mix the rice with all the ingredients. 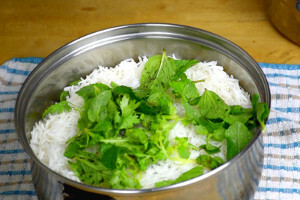 Place the fried shallot, mint leaves and coriander leaves on top of the rice. Cook over low heat for 35 minutes. The exact time depends on the quantity of rice, the distance of the pot from the flame and the power of the stove. You can test the doneness by tasting it. If it is still too hard, cook another five to ten minutes over very low heat. The rice can burn quickly so be patient. 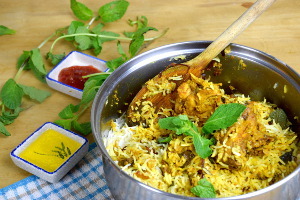 58 replies to "Chicken biryani recipe – how to cook the best rice dish in the world"
Hi last time i cooke biryan using your recipe it tuned out awsome. 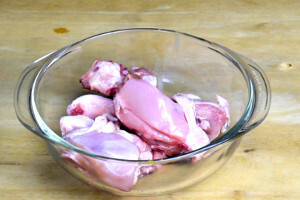 This time planning to replace chicken with mutton what changes should i do in recipe. The easiest adaptation is to change to chicken to mutton and leave the rest unchanged. If you can get mutton with bone-in then is even better, as the bone will contribute flavor to the rice. Hi my only concern is mutton takes more time to get tender in compression to chicken .so shoul i give two three wishes nefore placing it in handi. I overlook this in my previous reply. Mutton take more time to cook so you are right to give it 2-3 whistles (pressure cooker) before cooking with the rice. If you are using the normal stove, cook it over low heat until it is fully cooked. Keep stirring to avoid sticking. Marinate it overnight helps to tenderize the meat. Also, add some tenderizer if you want. Tried your chicken biryani rice recipe yesterday and it was really good. Only thing was that I kept it a little longer time and the chicken was slightly overcooked. My entire family liked it very much so much so they did not get any oil taste as compared to the biryani I used to prepare before. The aroma was really good. Thank you for sharing the recipe step by step and keep up your good work. Thank you for trying the biryani rice. Wish you will love to try other recipes too. Tried your chicken biryani rice recipe today and it was fantastic. Really delicious minus the extra oil as compared to those from restaurant. Thank you for sharing the recipe plus all the extra tips. Feel really happy that the biryani recipe works for you. I will sure put in the effort to have more quality recipe in future. When you say put a saucepan under the potdo you mean upside down. So the pot sits raised on the bottom of the pan. You can try both ways- upside down and the other way round. The problem that I faced was the heat of my stove is too high (even I set it at the minimum), and I just want the raise the pot of rice a little far from the heat.If you have a good stove that can adjust to very minimum temperature, you may not even need to do that at all. I cover the pot of rice and seal it with aluminum foil and pop it in the oven @250F for 1 1/2 hour. Your method is equally good. Use it as long as the biryani rice taste great. Me and my wife tried your briyani recipe today, and even though its our first time cooking briyani dish, the result was beyond our expectation. Its perfect. But we have one small problem, the chicken in the bottom of the pot was overcooked and became sticky to the pan. Do you think it caused by a too much heat? Thanks for trying out the recipe, and really happy to know that it works. You may consider using a smaller flame to cook the rice next time. 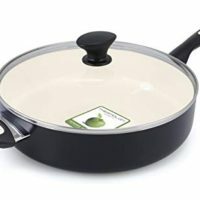 You may put a small saucepan or a steamer rack on the stove first and then place the pot of rice on top to increase the distance of the heat from the pot. That will help to reduce the chances of the chicken to get burn or get stick to the pot. It’s looking awesome. Thank you so much for sharing your recipe. Hi KP, Can you post the cup/tablespoon measures as well? I know this is not the best way but I don’t have a scale at home and badly want to try your recipe. No problem. But I suggest you get one. You will not regret the small investment! Here is the conversion for chicken briyani rice, bracket in tea and tablespoon. I will try this method for our midterm practical exam, Wish me luck hehehe. Guess you are sitting for the culinary exam. Good luck. Wish you all the success in making chicken biryani. Pour the dry, uncooked rice into a container filled with water. Let the rice soak in the water. Then remove the water from the rice. You can do so by pouring the rice and water through a wire mesh strainer. Hope that I manage to explain it clearly. I like your recipe coz most of the ingredients are locally available except for the bay leaves. I want to try it for the first time, but for the chicken, should it be precooked or raw? The chicken is raw. Put the chicken in the pot and then cover with the half cooked rice. Then cover and cook again. At the end of the process, the chicken will be cooked too, and the chicken flavor will penetrate into the rice. Use dry bay leaves if you cannot get the fresh one. I do that all the time to cook chicken biryani rice. 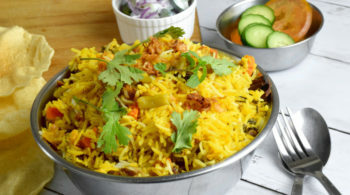 hai..i really love your recipe…your useful tips on how to cook biryani rice..its my favourite food…and im happy with your explaination….will try to cook this recipe on first eid. You are welcome, it is perfect for EID. Thank you so much for this recipe, it is delicious. I made it for family on Eid-ul-fitr 2018 and everyone love it. They were complementing me but it is you they should really be complementing! I shall be sharing this recipe with everyone I know! Happy to know that your biryani was a success. Please share with others. I tried this recipe twice and both times it came out amazing..thanks so much!! Thanks for trying the biryani recipe and glad to know that it works. 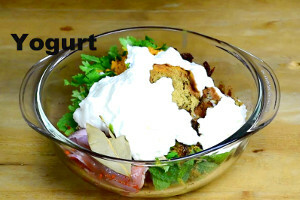 Please try other recipes in this blog. These are all Asian favorites. There are many ways to cook. Add tomatoes is one way. Reduce some amount of water if necessary so that the rice is not too wet. I am a little confused on the easy way. Please let me know if I understand it correctly. I soak the rice in water for 45 minutes. Mix all the spices with the chicken stock. Bring the spice mixture to a boil. Add the rice, top it with the fried shallot, mint and coriander leaves and cook over low heat for 35 minutes. Not exactly correct. Let me make it clearer based on your description of making the biryani rice. Soak the rice in water for 45 minutes. Drained. Bring a pot of water to a boil and add a teaspoon of salt into the boiling water. Then put the soaked (and drained) rice into the hot water to boil for three minutes. Remove the half-cooked rice from the boiling water. Drained again. Mix all the spices with the chicken stock in a pot. Do not boil the spice. 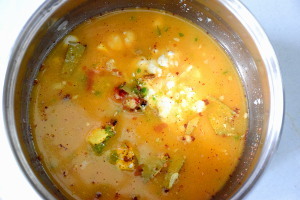 Pour all the half-boiled and (drained ) rice into the pot and mix well with the spice/stock/yogurt. Top it with the fried shallot, mint and coriander leaves and cook over low heat for 35 minutes. I hope it is much clearer now. Hi! 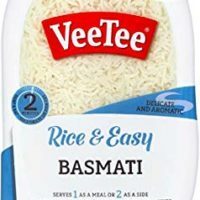 What would be the adjustments if I want to use whole grain brown basmati rice? Thank you! I have not used whole grain rice to cook biryani rice. I do use other rice to prepare a different rice dish and think I should fine by substituting it for the white basmathi rice. Thank for using this recipe for your upcoming party. I have not purchased the saffron from this company before, but I think I should be of good quality as it is quite pricey. I notice that the amount in the recipe is unclear, which I have changed it to 1 teaspoon saffron for 250g rice. Saffron is one of the ingredients of the briyani rice which is relatively expensive. Some people omit it, but it is good to have it especially it for your guest. Wish you all the best and have a great party. Hello, I think your article was amazing! The amount of rice in this recipe is 500g. You can multiply All the ingredients by 10x to become 5kg (5000g). Certainly you need a very big pot to cook 5kg. Since the amount is much larger, I suggest you cook for a longer time, use a slightly (but not to much) higher heat. Also try not to put the pot too close to the flame (use something to lift up the pot a bit) to avoid the chicken and rice from getting char at the bottom. Wish you will cook the large batch of chicken biryani successfully. Thank you for your frutiful reply. Yes indeed I will require a big pot. But how much tym exactly will i need to cook in a low flame that is where i am lagging behind for my huge amount. I have not cooked that amount for some time. So I suggest you cook the rice over low heat, but enough to heat up the rice that covered with a tight lid. The flame will be larger than for one 1 kg, just enough to maintain a very minimum steam escape from the top. Cook for 45 to 60 minutes, open and close the lid quickly to get a sample of the rice to test the doneness of the rice at 45th minutes. And you can decide how much longer to complete the cooking until the rice is fully cooked. i am vegan and my friend ony eats fish – how would i adapt to do a veg one and a fish one ? sorry to be a pain ! I have not tried to convert this recipe to vegetarian biryani. I will keep in mind to develop one vegetarian biryani. There are too many changes required and therefore create a new one is a better option. Thank you so much. Hope you like my chicken biryani recipe.